Live life with zest and intensity is rather than 'playing it safe'! 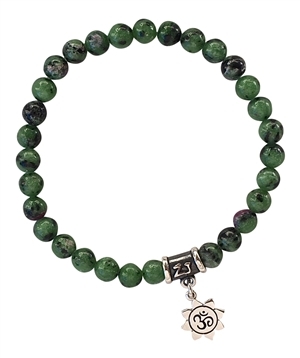 Read about our handmade Ruby Zoisite healing gemstone bracelet below to see if you connect with this crystal. Provides energy for the rebirth of oneself. Emanates an energy of growth in all aspects of life. Allows for the mind to 'hear' the heart's urgings and to understand them sufficiently to act in favor of them. The stone of life force, courage and passion. It reminds one that living with zest and intensity is more satisfying than 'playing it safe'. Creates a sense of well-being. Zoisite with Ruby is one of those truly fortunate natural mineral combinations. Green Zoisite emanates an energy of growth and fertility in all aspects of life. It can support the reproductive process on all levels, from conception to birth, as well as optimal growth and development through childhood. It provides energy for the rebirth of oneself into the soul, fostering inner development through childhood. It is an excellent stone for people who have recently 'awakened' to their spirituality, because it strengthens the neural and energetic connections between the brain and the heart. This allows for the mind to 'hear' the heart's urgings and to understand them sufficiently to act in favor of them. Ruby is a stone of life force, courage and passion. It stimulates the root chakra (chakra 1), providing an infusion of vitality which can make one feel rejuvenated and enthusiastic for life. It reminds one that living with zest and intensity is more satisfying than 'playing it safe.' Ruby nourishes the body and one's physical energies, without which one's emotional and spiritual life can come to a standstill. When Ruby and Zoisite are combined in a single stone, the root, heart and third eye chakras are strongly stimulated and harmonized. This creates the potential for a truly magical manifestation of one's inner and outer development. Zoisite with Ruby energizes the body and creates a sense of well-being. It increases the intensity of the heart's yearning and facilitates the dramatic opening of the heart chakra, which has the capacity to change one's whole experience to one of rapturous engagement with the world. This stone can bring about increased intuitive abilities, whereby one simply 'knows' things without having to work them through logically. All of these awakenings blend together into one feeling - it is as if one had been living as a sort of echo of one's truth, full self, but now that fullness has finally arrived! Ruby Zoisite has been known to be helpful for immune imbalances and cancers, as it can help activate the body's defenses and healing mechanisms. Zoisite can be helpful to restore vitality after radiation, chemotherapy or pharmaceutical treatments. It is considered a detoxifier, neutralizing over acidification and reducing inflammation. This gemstone can stimulate fertility, heal disorders of the ovaries and testicles.